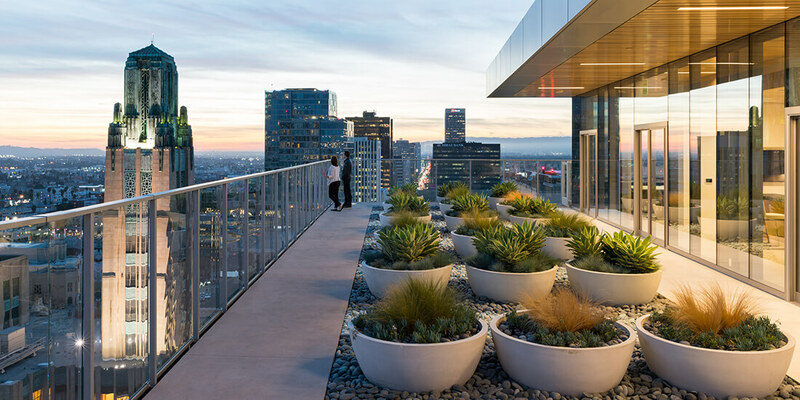 The rooftop of the multi-use 3033 Wilshire tower in Los Angeles. Courtesy Hunter Kerhart/Steinberg Hart. Though seemingly opposite environments, cities are a lot like rainforests. At ground level, the world is dank, dark, and full of predators. Inhabitants seeking fresh air, sunshine, and privacy have only one direction to go: up. So in the urban jungle, it’s only natural to build a “canopy” in the form of rooftop architecture. The popularity of rooftop amenities across residential, commercial, hospitality, and even health-care projects shows that’s exactly what’s happening. Examples abound. When it opened in 2016, the Goettsch Partners–designed Hilton LondonHouse Chicago hotel debuted the city’s only trilevel rooftop; crowning the historic London Guarantee Building, it features an indoor bar, an outdoor terrace, and private top-floor dining inside the original Beaux-Arts cupola. In 2015, Facebook moved into its corporate headquarters in Menlo Park, California, with a nine-acre rooftop oasis that includes cafes, full-grown trees, “work cabanas,” and walking trails. And this summer, a 1.5-acre rooftop concert venue opened at New York’s Pier 17 in Lower Manhattan’s revitalized South Street Seaport. San Francisco’s 5.4-acre Salesforce Park, which sits above a major transit center, features many gardens, an 800-seat amphitheater, and a half-mile walking path. Courtesy steelblue for Pelli Clarke Pelli. According to Nathan Wilcox, principal at Austin, Texas–based architecture firm Sixthriver, the current obsession with rooftops began in the early aughts, when the US Green Building Council’s Leadership in Energy and Environmental Design (LEED) rating system brought sustainability to the forefront for architects, developers, owners, and regulators. In 2002, the City of Chicago passed an ordinance making green or reflective roofing compulsory for new and refurbished roofs. Thereafter, green roofs flourished. Ready to design a rooftop oasis? Get the right tool for the job. Developers in cities that have run out of horizontal space must optimize vertical space—while maximizing revenue. That means infusing buildings with Instagrammable aspects that attract tenants and visitors without cannibalizing leasable square footage. The Fowler, a 204,000-square-foot apartment building in Boise, Idaho, designed by Holst. Courtesy Gabe Border/Holst. 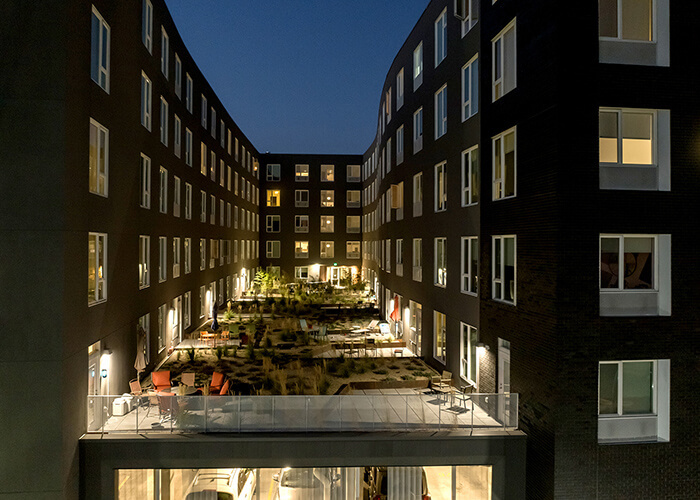 Architects must design rooftops in a way that exploits instead of arrests that feeling, says Kevin Valk, partner and design director at architecture firm Holst, based in Portland, Oregon. Holst designed the LL Hawkins, a 125,000-square-foot LEED Gold apartment building in Portland, and The Fowler, a 204,000-square-foot apartment building (also anticipating LEED Gold) in Boise, Idaho. When he designs rooftops, he uses drone photography to convey the view, then builds his design around it. On a rooftop pool, for example, a glass guardrail can provide safety without compromising the scenery. “If somebody is lounging on a recliner, can they still see what you want them to see? You try to create as much visibility as you can,” Valk says. 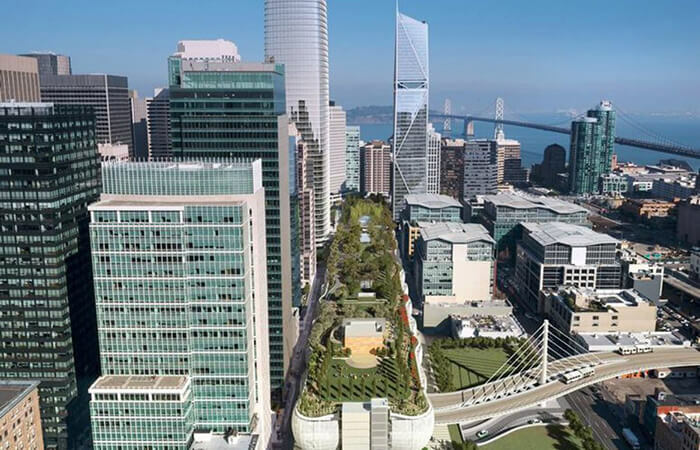 San Francisco’s new 5.4-acre Salesforce Park embodies the best of rooftop design. Located atop the new Salesforce Transit Center, which opened in August, it features 13 gardens, a central lawn with trees and a picnic meadow, movable chairs and tables, an 800-seat amphitheater, a half-mile walking path, and a restaurant. Details such as outward-facing, single-person benches—where downtown workers can de-stress during quiet moments overlooking the city—indicate thoughtful design of PWP Landscape Architecture. Rooftops’ altitude and exposure also make them magnets for heat. 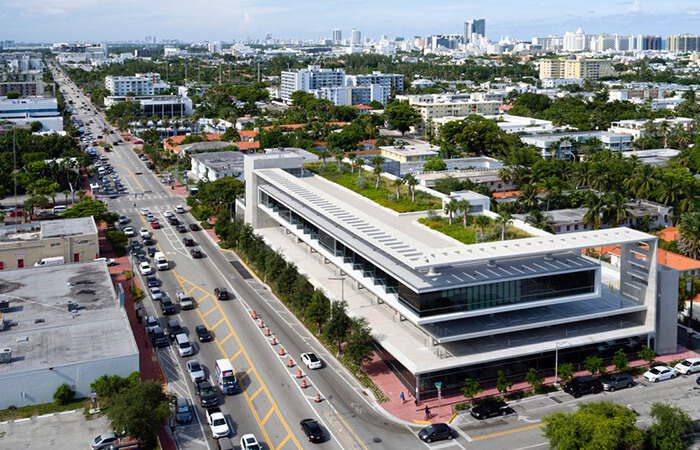 “We try to use very light materials to keep the heat load off the roof,” says architect Kricket Snow, an associate principal at Perkins+Will Miami. The firm recently designed a green rooftop for Baptist Health South Florida, a new outpatient facility with a wellness center that uses the rooftop for physical therapy and yoga classes. Baptist Health South Florida’s green roof minimizes heat impact through strategic placement of light-color pavers, a canopy, and shade trees. Courtesy Robin Hill/Perkins+Will. Because of wind velocity and hurricane threat, the pavers on Baptist Health’s green roof had to be secured using special clips that keep them from becoming airborne, according to Snow. Roof elements of all sorts—including trellises, awnings, and furniture—must be considered. Water removal is always a major concern, says Snow, who sloped the facility’s roof to assist with drainage and used a pedestal paver system to create a level surface for wellness programming. Architects must consider the extra weight of roof-decks, and they must creatively conceal obtrusive mechanical equipment that typically resides on rooftops. At Baptist Health, for example, Perkins+Will placed the mechanical equipment a level below the rooftop deck, completely hidden from view. At Salesforce Park, designers created mounded, vegetated “hills” to disguise elevator and venting shafts. And finally, local building codes dictate safety features such as guardrails, egress requirements, and occupancy limits, all of which place design constraints on architects. Every building needs a roof. But does every building need a rooftop?